SenseCam, a small, wearable camera that works without user intervention, is set to change the way memory loss patients are being treated. A small, wearable digital camera could be used to treat memory-loss patients. London, England (CNN) -- A small, wearable camera that captures images automatically could change the way memory loss patients, in particular those with Alzheimer's, are treated, experts say. The SenseCam takes low-resolution photographs (about one third of a mega pixel), with a fisheye lens, at a rate of two per minute. These low quality shots may not be going in the family photo album, but they are enough to prompt our brains to access previously locked information, researchers say. "The SenseCam is all about recalling a piece of information someone already has, rather than creating a memory," said Dr. Emma Berry, a clinical neuropsychologist , who has been working with memory loss patients using the camera. She has also been working with Microsoft Research, who produced the camera, to conduct clinical trials. In the initial trial, a woman with severe amnesia was given the SenseCam, which is worn at chest height. The woman repeatedly reviewed episodic images of her daily life taken on the camera with her husband. This triggered memory recall, according to Dr. Berry, who is based at Addenbrooke's Hospital, Cambridge, UK. She said: "She viewed the images and 'the memory came flooding back' -- as she put it -- when we asked her about it later, she described events in detail. She could tell us things that were not in the images on the SenseCam." Researchers then took the images away and the patient was able to recall events up to 10 months later, Dr. Berry said. While not conclusive, the results of the tests have been encouraging, she said. Now, SenseCam is being tested with a handful of people who have Alzheimer's disease, with similar results in findings that have yet to be published. "When the patients viewed SenseCam images of events they had experienced, they were able to recall the events three months later without needing to review the images," Dr. Berry said. Previously, patients suffering from memory loss would keep written diaries but this has had limited success in creating enduring memories. "We think that Alzheimer's patients are able to store the memory but are unable to access it," said Dr. Berry. "Even motion blurred pictures have an effect on recall" she added. Neil Hunt, Chief Executive of the Alzheimer's Society said the device could be potentially exciting for Alzheimer's patients. He told CNN: "Many people with memory problems find aids such as diaries can offer psychological benefits. "This new camera could potentially act in the same way although practically it needs to be very simple to operate, and time would need to be set aside to select and store the images. "Assistive technology is an exciting area of research. We look forward to the development of many more tools that empower people with dementia to have the quality of life they deserve." The SenseCam also has several sensors other than the image sensor embedded, including infra-red, heat, heart rate and pressure to record health monitoring data. While the battery requires a daily charge, the 1Gb of memory (little more than your iPod Nano), can store up to 30,000 photographs. 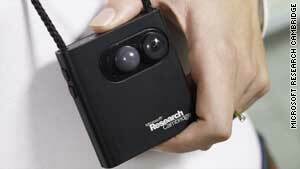 The SenseCam was invented in 1999 by Lyndsay Williams, a researcher at Microsoft's research laboratory, who wanted to build something to solve simple memory problems, such as losing keys. Vicon, developer of motion capture products used in Hollywood, will be mass-producing the device as the Vicon Revue and is expected to cost around $800. Questions linger over abuses of a potentially voyeuristic device but Steve Hodges, of Microsoft Research, is positive about SenseCam's commercial future: "I like to think of it as becoming the microwave oven of home movies."